Your jack-o-lanterns are lit, cobwebs are placed strategically, and you have stockpiled enough candy to last you through next Halloween. 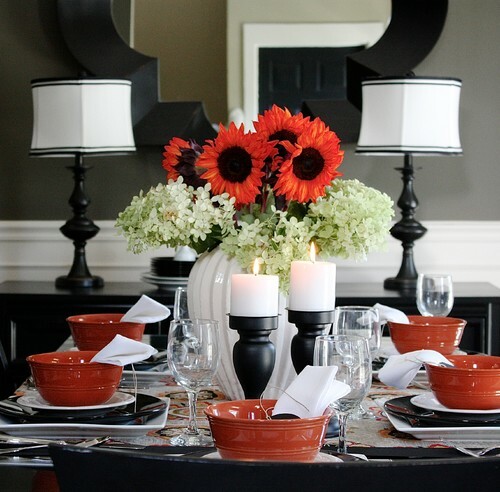 Before guests arrive, look to your accent tables or dining room table and add some flair with a Halloween tablescape. Here are some loose guidelines to follow no matter your style. Orange and black are classic Halloween colors, but white and neutral beige tones are equally decorative on pumpkins, candles, ribbon and baskets. Breaking up bright orange and dark black with these natural alternatives will make your decorative items, pumpkins and bats, for example, make an even more impressive statement. If your centerpiece is almost perfect, but isn’t achieving the full look you were hoping for, use fall home accents to fill in the empty spaces. An autumn leaf garland is the perfect solution, as it will complement your color scheme and add a lively touch to the table. Also, you can never have too many pumpkins, so use them to fill in extra space or scatter on tabletop pedestals among your skulls, bones and witches. Maybe you are opting to go simple this year with a tablescape, or need one for dinner tomorrow. No worries – think simple! A large vase in the center of the table is an attention-grabber, especially when filled with seasonal flowers and plants. Add a few candles – bonus points if they are orange, black, and seasonally scented! – and scatter some leaves (found outside) along the length of the table. 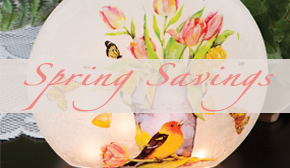 Decorative placemats will pull the look together and give you a beautiful table in no time! 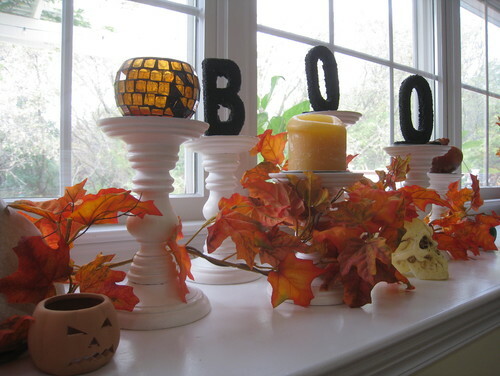 For a more personal touch, turn to DIY projects for your Halloween centerpieces. From bats to glittery Halloween pumpkins, the tables in your home will be decked out in ghoulish style in time for the 31st. 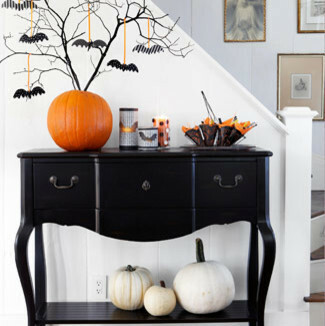 To get started, check out some of our favorite Halloween DIY projects. Share your tablescapes and DIY ideas with us in the comments, on Facebook or Twitter, and have a spook-tacular (and well decorated) Halloween! This entry was posted on Thursday, October 13th, 2016 at 8:29 am	and is filed under Apartment, Candles, Crafting, DIY, Decorating, Dining Room, Harvest, Holiday Decorating, Seasonal Decorating, Thematic, Thursday's Theme. You can follow any responses to this entry through the RSS 2.0 feed. You can leave a response, or trackback from your own site.